CALGARY, Alberta (AP) Sean Monahan knows exactly where to go when Johnny Gaudreau has the puck. Monahan converted Gaudreau’s pass for the go-ahead goal 9:09 into the third period Sunday night and the Calgary Flames broke a four-game home losing streak with a 2-1 win over the Washington Capitals. After not finding anyone open as he carried the puck toward the net, Gaudreau curled back at the faceoff dot and tried again, this time spotting Monahan alone at the far post. All the Flames’ leading goal scorer had to do was slide in his sixth of the season. Micheal Ferland, the third member of Calgary’s top line, scored the other goal for the Flames. In his best effort of the season, Ferland also had a game-high five shots and a game-high seven hits. Calgary improved to 1-1-0 on a seven-game homestand that continues Thursday night when the two-time defending Stanley Cup champion Pittsburgh Penguins visit. The win came Saturday in Edmonton, but playing on back-to-back nights was not something Vrana would use as an excuse. Still trying to find their Presidents’ Trophy form from a season ago, the Capitals are back in action Thursday when they host the New York Islanders. ”That’s a huge loss for us. 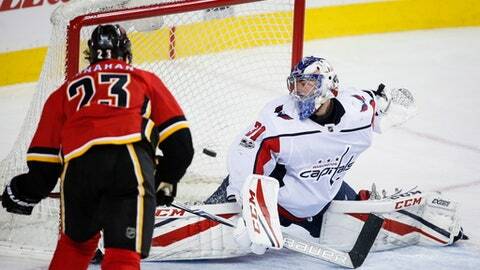 At least we have to take one point today, but we didn’t,” Evgeny Kuznetsov said. Calgary took a 1-0 lead into the third before Washington tied it at 4:19 after TJ Brodie’s outlet pass hit a linesman. Moments later, Vrana fired a shot that slipped under the glove of Mike Smith. But that was the only puck to elude Smith, who made his NHL-leading 11th start. Acquired in an offseason trade with Arizona, Smith has been the Flames’ best player all season and was excellent again against the Capitals. NOTES: Jaromir Jagr (lower body) is eligible to come off injured reserve and he’s back skating with the Flames, but he missed his fourth straight game. … Sam Bennett has yet to pick up a point in Calgary’s 12 games. … The Flames made two changes, putting Kulak and RW Curtis Lazar in the lineup. It was just the third game for Kulak. … Washington made one personnel change from Saturday, inserting Aaron Ness on defense in place of Taylor Chorney. Capitals: Host the New York Islanders on Thursday night. Flames: Host the Pittsburgh Penguins on Thursday night.